The little town of Krucemburk and its two villages Staré Ransko and Hluboká lie in the Vysočina region, in the district of Havlíčkův Brod. Based on the results of the referendum in 1993, the town returned to its original historical name. Thus finished the period between 1949 – 1993 when it was called “Křížová“. This Czech name was not accepted unanimously by the local population in 1949, it was assigned and the locals continued using the original name Krucemburk. Similarly, people who were born in Křížová – will always feel “Křížová residents”. The oldest written records of the town date from 1241. In 1385, Krucemburk was granted small town status by Epík of Hrádek and given his coat of arms, three silver wolf teeth in a red field. These symbols are still used today. 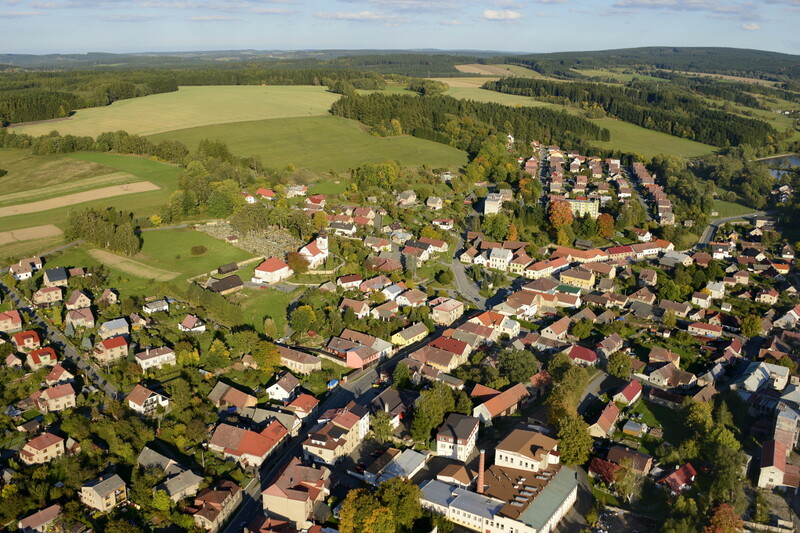 Krucemburk, Staré Ransko and Hluboká offer a rewarding life for their almost sixteen hundred inhabitants in the beautiful countryside of the Czech Moravian highland region. The altitude here is between 550 – 661 metres. Krucemburk has something to offer in every season. Besides unspoilt countryside and very fresh air, there are thick forests, a recreational lake called Řeka spreading over sixty hectares and its camp nearby, a recreational ground called Štíří důl (Scorpion mine) hidden in the valley of the same name (named after the protected fire salamander living in the area, which has been called a “scorpion” by the original dwellers since time immemorial). Cycle tracks can take you to close or far away places and in your bike saddle you can easily reach, for example, the region of Žďár and Přibyslav, Havlíčkova Borová, Veselý Kopec folk-museum , the whole region of Podoubraví, and other beautiful places of interest. Staré Ransko had a long history of mining and ironworks in the Vysočina region. When mining finished, some of the places were flooded and there are small Ransko lakes now which are frequently visited by day trippers and which were declared nature reserves in 1990. Besides these nature reserves, there is the National Nature Reserve of Ransko spreading over almost 700 hectares. Hluboká is slowly becoming a cottage-dweller village which is gaining a picturesque look thanks to the care of the cottage owners. In 1906 the countryside around Krucemburk enchanted the then university professor Tomáš Garrique Masaryk during his summer stay and it will enchant you, too. Krucemburk, in world-famous painter Master Jan Zrzavý's words “a small town up the hill”, can offer you 15 nationally protected sights. Certainly, the previously mentioned beautiful countryside has influenced famous artists contributing to the history of the little town and leaving their works there: sculptors Jan Štursa and Vincenc Makovský, architect Josef Gočár, painter Jan Zrzavý, painter Jiří Binko and others. You can pay your respects to Master Jan Zrzavý at his grave in the Catholic cemetery. 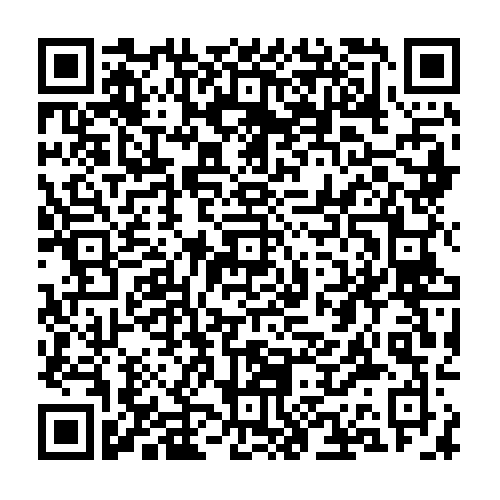 You will be provided with information about his life, his works and more in the Memorial Hall of Jan Zrzavý in the Krucemburk Information Centre in the building of the council offices. There are lots of interesting organizations whose activities have, on the whole, been carried out for decades. Namely, the Association of the Friends of Krucemburk, the Association of Jan Zrzavý, the puppet theatre company Oblázek (Pebble), the sports club Perun Hluboká, the sports club Spartak Staré Ransko, the Sports Club Sokol Krucemburk, the chess club, philatelists, gamekeepers, gardeners, breeders, firemen, and others. Krucemburk lies on a former trail called Trstenická which crossed another important trail called Liběcká near the small town. In the 11th century the local border area was covered with thick and dangerous ancient woodland, most paths used to follow currents of water. A fortified stronghold was probably built to protect the path there. The master of the mint, Adam of Brno, found shelter there from the Tatars who plagued Moravia in 1241. These are the first written records of the settlement. Krucemburk was called Kreuzberg at that time. The whole deserted region belonged to a very rich aristocrat, Jan of Bratčice, who when establishing the town of Polná, went under the name Jan of Polná. From that period also dates the establishing of the town of Přibyslav and the monastery in Žďár. Jan of Polná donated the so-called Slubický forest, an area from the rivers Doubravice (Doubrava today) and Kamenice (Chrudimka today) to Přechod (the village of Bílek today), to an order of German knights. The deed was approved by King Václav I at Konopiště. The German knights founded a settlement there called Kreuzberg (Křížový vrch – Cross Hill) before 1240. They did not establish other settlements here, nor were they patrons of the local church which was also established in the 13th century and carried the name of Saint Mikuláš. In 1247 – 1261 there was a master of the mint Arlanus Hericus Karel Jindřich who used silver from Přibyslav to mint coins called Braktáty. 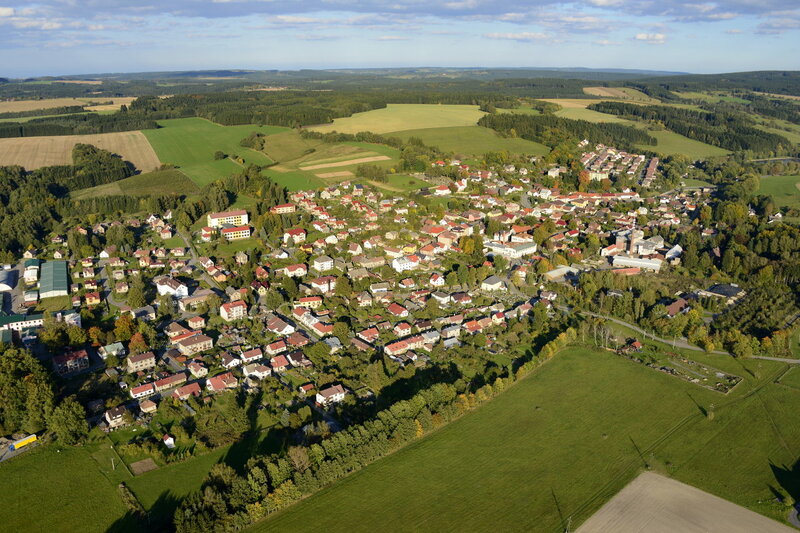 The place where the master of the mint was born was Kreuzberg in Thuringia. He is said to have built the fortress here and given the settlement the name after his birthplace. This is the second improbable version of the name of Krucemburk. 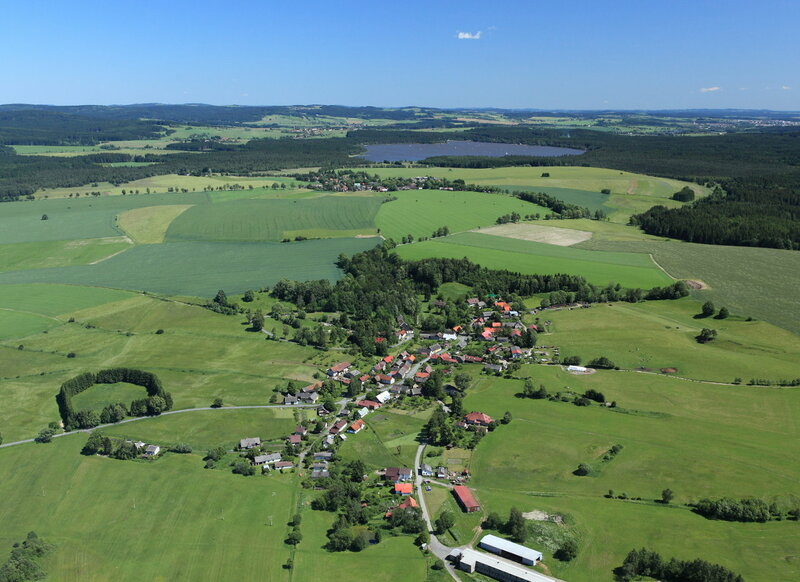 The German knights probably did not like the area because of the poverty in the region, therefore, they sold Kreuzberg to marshal Jindřich of Lipá in 1321. He later sold Kreuzberg to a certain Lev of Kreuzberg. The next owner was knight Epík of Hrádek, a patron of churches in Studenec and Krucemburk, who granted Krucemburk small town status in 1385 and gave it his coat of arms, three silver wolf teeth in a red field. This crest is still used today. The Epíks used the name of Krucemburk even later when they did not own it anymore. Major development came during the ownership of the Střelas of Rokyce. Krucemburk was bought by knight Mikuláš Střela of Rokyce, a military commander of King Jiří of Poděbrady and Vladislav Jagellonsky, in 1474. The Střelas were of protestant religion. The last protestant Střela was Purkhrad Střela, who was punished by suspending his holdings after losing the Battle of White Mountain. After his death, his widow Sabina and their two sons converted to Catholicism and the emperor returned their holdings back to them and raised the sons to barons. Mikuláš Střela, and probably one of the later Mikulášes, is remembered by the relief of a knight in full armour which is placed in the Catholic church and is from the Střelas tombstone. Mikuláš Střela is considered to be the patron of the town today. The school was probably established during the Střelas' ownership. The Thirty Year's War and the following period of anti-reformation tragically marked Krucemburk. As well as a military campaign of the Swedish army which plagued the area, Krucemburk did not escape destruction, the Střelas' castle, church, and vicarage were destroyed and burnt down. A lot of houses were burnt down at the same time and that is why some residents left Krucemburk and their farmsteads were deserted as shown in the listing of property from that time. In 1677, prince Ferdinand of Dietrichstein bought the Krucemburk manor and reinstated the church and vicarage. He did not reinstate the castle and connected Krucemburk to his Polná-Přibyslav manor. In 1670 Emperor Leopold issued a privilege to organize annual markets in the town. Merchants and craftsmen particularly improved life there. One of the prominent families in Krucemburk was the Skřivan family who influenced life there at that time. Their ancestor was a caretaker of Rudolf Střela's castle. The Skřivans established tanner manufacturing in 1728. The tannery operated for more than two hundred and fifty years. Augustin Skřivan was a long time city mayor of Krucemburk. His brothers MUDr. František and Antonín Skřivan were important people in the Czech nation. 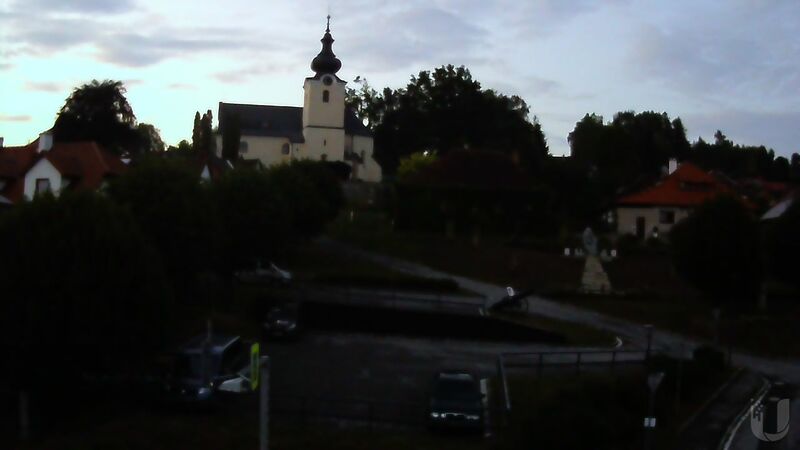 The Three Crosses were hoisted at the suggestion of the pastor Vrba in 1778, many times reinstated as a permanent symbol of the town since then. Six months after issuing the Patent of Toleration an Evangelical Lutheran congregation was established here, the first in Czech. A new Evangelical church was built in 1840. A new school was built in 1855, a post office was open in 1868. On the 16th May 1871 trains started running between Německý Brod and Rosice nad Labem. The train station in Ždírec was called Ždírec – Krucemburk. In April 1893 there was a disastrous fire in Krucemburk, more then half of the houses burnt down and almost one thousand people lost their homes. Professor Tomáš Garrigue Masaryk, later the president of the country, spent the summer here with his family in 1906. He used his stay to organise lectures in neighbouring towns and also in Krucemburk. Later, the Binko family became the owners of the tannery. Important people of this family were Josef Binko, a pioneer in Czech photography, Ivan Binko, the author of books about tanning and the painter Ivan Binko who is, among others, the painter of the stained glass windows in the Catholic church of Saint Mikuláš. Brothers Josef and Dušan Binko were brothers-in-law of the famous Czech architect Josef Gočár. Gočár and other family relatives of the Binko family, the sculptor Jan Štursa, left their works in Krucemburk. Another famous sculptor Vincenc Makovský had his ancestors in Krucemburk and he designed a tombstone for victims of war who were of Evangelic religion. The painter Jan Zrzavý, who depicted Krucemburk several times in his paintings, loved Krucemburk, his father's birthplace, so much that he chose this town as his resting place. Cultural and social life in Krucemburk was in its prime during the era of the First Republic. This period was violently interrupted by the Nazi occupation. In January 1945, Krucemburk was surrounded by SS armed forces and the Gestapo and they started arresting people collaborating with partisans. Twenty four people were arrested and half of them did not survive the interrogation and torture in the concentration camp in Terezín. On top of that, as if it was not enough war suffering, Krucemburk was bombed heavily on the 9th May 1945 and 26 people died. A lot of people were hurt and there was extensive material damage, too. In 1949 Krucemburk was renamed Křížová against its residents' wishes. The original name did not return until 1993. It was founded by Zdeněk of Ronov after 1355 when a large deposit of ironstone was found in the surrounding area of a newly established settlement. Ironstone started to be mined under the so called Ransko mountain (Babylon). Ransko or Ronwald, as it was called then, became a new mining settlement. At that time, the production of iron ore, which was further forged in the ironworks, was begun. At the beginning, iron was smelted in primitive furnaces, later on in smoke furnaces. Major expansion of the ironworks took place in the first half of the 19th century when there were four blast furnaces working. At that time, the ironworks in Ransko and the ironworks in Polnička were part of a collective factory ranking the second largest ironworks in the Czech Republic. After various ownerships of the Polná-Přibyslav manor, this confiscated manor was bought by cardinal prince František of Dietrichstein. During the Dietrichstein ownership there was major expansion of the Ransko ironworks. When the ironstone was almost all mined, at the end of the 19th century, there was not enough wood for charcoal production. Importing wood and ironstone by train was expensive and therefore there was a gradual decline in the ironworks. First to close down was production in Polnička, then in 1886 the Ransko ironworks, along with the mines. This brought an end to almost five-hundred-years of tradition of the ironworks in Staré Ransko. Before that, in 1872 Josef Janáček founded an engineering shop which continued as an engineering company, a foundry included, on the premises of the former ironworks. The company, which was put under state ownership and owned by various companies, is now owned by a company called BEHO and it continues in the tradition of engineering production in Staré Ransko. The mining of ironstone was renewed in Staré Ransko during the 1960s – 1990s after a mine called Tereza was founded. Staré Ransko has the feel of an industrial village. An alley of old trees, which are protected, leads to a former manor. Also, the surroundings of Staré Ransko are attractive, thick forests towards Havlíčkova Borová, with a peak called Babylon with the remains of the former mines. The recreation ground by Lake Řeka, Ranecký and Pobočenský ponds all complete the beautiful look of the village. In the locality where Hluboká lies, there used to be a trail called Liběcká. Hluboká was probably founded at the turn of the 13th and 14th century, as most of the villages at that time. The first written records of Hluboká date back to 1548 to the listing of the owner of Krucemburk, David Střela from Rokyce. Hluboká belonged to his Krucemburk manor. It used to be a farming settlement, some of whose residents worked in the Dietrichstein ironworks and mines in Ransko. Later on in factories in Krucemburk and the surrounding areas. From 1822 there was a school in Hluboká which was later closed in 1963. 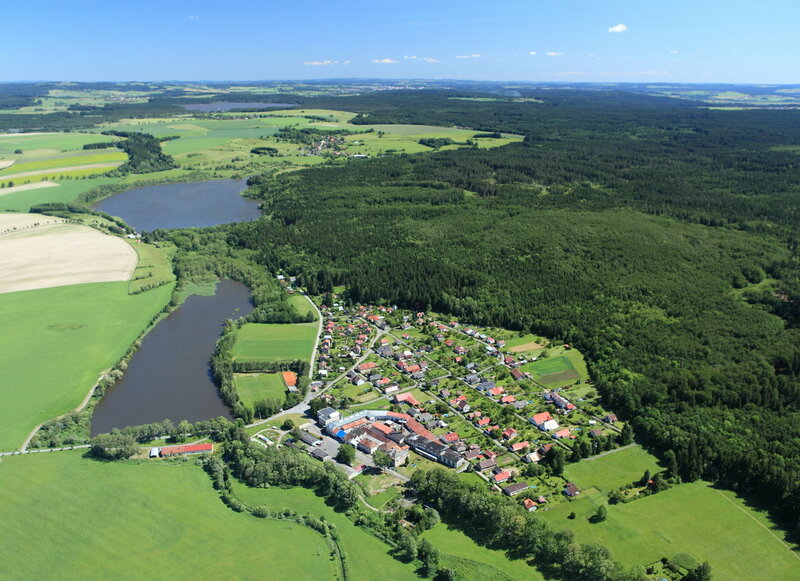 Today there are a lot of cottage dwellers who are attracted by the nearby lakes of Řeka and Velké Dářko, the thick forests and beautiful countryside. Not far from Hluboká, there is a natural formation called Štíří důl (Scorpion mine) where you can find the protected fire salamander (Salamandra salamandra).